Another Long Walk: The Tahoe Rim Trail Revealed! A sample of an old flume that used to bring logs down to the mines. For years I've wanted to hike this trail. For months I planned to do so. I did research, bought guidebooks and read blogs and stories about the trail. By all accounts, it's an awesome trail: The Colorado Trail. But this trail wasn't much different in a lot of ways. For years I've wanted to hike this trail too. I even purchased a guidebook about it about five years ago, which I found, dusted off, and started reading through. I've even done a 50-mile portion of this trail when I thru-hiked the Pacific Crest Trail, and that section was beautiful. 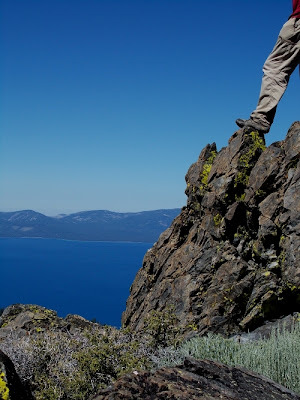 Oh, yes, I so wanted to hike the Tahoe Rim Trail. around the mountains that surround Lake Tahoe. I checked if there were any closures on the trail due to wildfires (you can't be too careful about these things! ), but by all accounts, the trail was wide-open for hiking. So Amanda and I flew out to Reno, Nevada--the biggest little city in the world. (At least that's their claim. I'm not voicing any opinion on whether I think that's true or not!) 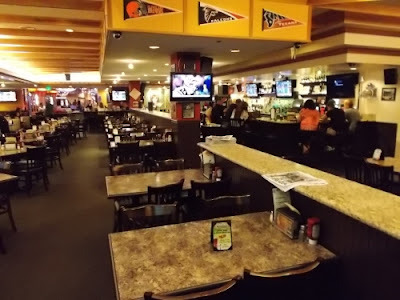 We missed the first couple of flights, which didn't get us to the airport until nearly 10:00 PM, and we drove down to Carson City where we booked a motel room for the night. It was definitely a lot later than we wanted to arrive, but it left us well-situated for Amanda to throw me out on the trail the next morning, not even a half hour drive away from the trail. A trail like the Tahoe Rim Trail has a unique problem for me: Where to be begin. 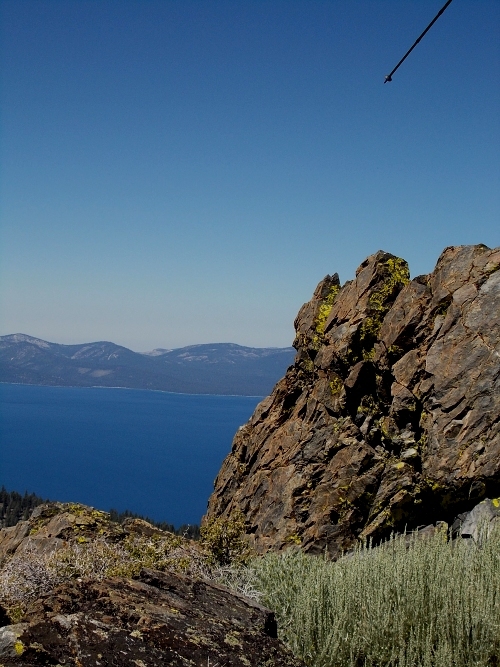 The trail is about 165 miles long, and loops around on the mountains (or the "Rim") around Lake Tahoe. It's a giant loop, though, with no beginning and no end. Trails like the Pacific Crest Trail have a specific starting and ending point, which narrows down your starting point to one of two places. Due to seasons or timing, the end is pretty much selected for you. Even when I hiked around Crater Lake on snowshoes, which was also a loop, we basically had only one place where we could start and finish--at the one point where the road was plowed and opened to cars. The only way to start somewhere else would be to walk there, but then we wouldn't really be starting there, would we? So just deciding where to begin was a major decision that I never really had to worry about before. There are access roads all around the lake that meant I could start hiking from any one of over half a dozen trailheads on any side of the lake. 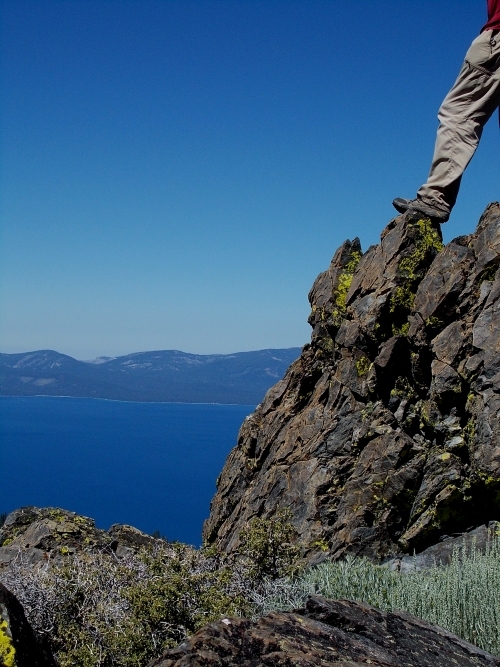 The trail runs through a single city--Tahoe City--which would be a great place to resupply. 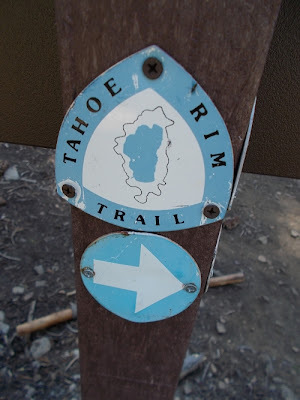 But it's a convenient place to start or stop, and the folks who created the TRT divided the trail into 8 sections, with section 1 starting in Tahoe City and running clockwise around Lake Tahoe. I had Amanda to drop me off at any trailhead I needed, though, so I decided I wanted to use Tahoe City as a convenient resupply point about halfway around the lake. 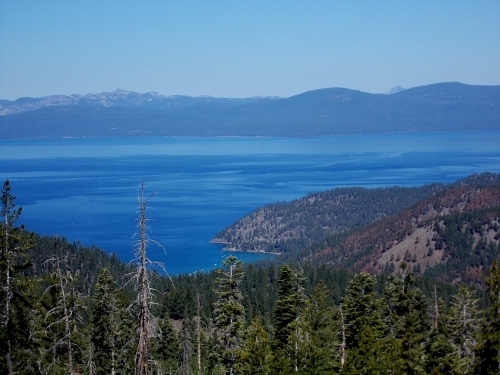 Wonderful views of Lake Tahoe! I also wanted to hike around the lake clockwise since every guidebook about the TRT assumed you'd be hiking in that direction. It just made things easier to follow along with in the guidebook. So Amanda and I looked at the Nevada sections of the trail, most of which were about 20 miles in length. Except for one section, from the Spooner Summit trailhead to Kingsbury Grade which was barely 12 miles long. It wasn't very long, but Amanda wouldn't be leaving town right away either. Nope, she could pick me up at the end of the day and drive us to artTrekker's place in South Lake Tahoe, a mutual friend of ours. Even more convenient, the trailhead was, quite literally, directly on the drive to South Lake Tahoe. Amanda could throw me out of car along the way while barely slowing down. The Kingbury Grade trailhead was a little out of the way, maybe ten minutes at most, but it was even closer to South Lake Tahoe so there wouldn't be any backtracking involved. It was perfect. I'd start from the Spooner Summit trailhead and hike clockwise around Lake Tahoe. 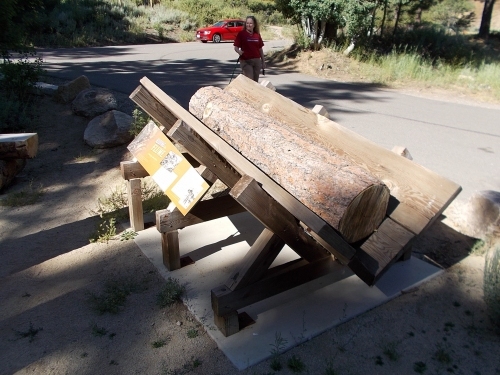 The trailhead at Spooner Summit had a wonderful display about the history of the area. The Comstock silver load was discovered in the nearby Virginia Range. They needed enormous quantities of lumber for the mines, clear-cutting most of the forests around Lake Tahoe and sending the logs down to the Carson Valley on long flumes filled with water. Spooner Lake was created to facilitate these flumes. One display described that men who didn't want to walk the 12 miles down the mountain would ride a log running down the flumes at up to 60 miles per hour--which had to be exhilarating, but I wonder how many people died or were injured from such a crazy thing. We read all about the local history, then I started down the trail with nothing more than a daypack. I carried two bottles of water--this section of trail allegedly had no surface water at all. The trail immediately climbed out from the trailhead to the top of the mountain ridges before largely leveling off the rest of the way. I saw my first views of Lake Tahoe through some trees. It wasn't a great view since most of it was obscured with trees, and after an hour or two, the trail came out to a breathtaking view that encompassed the entire lake. I sat down an enjoyed it for a bit, trying to pick out South Lake Tahoe to the south and Tahoe City to the north. Emerald Bay, as emeralds are want to do, sparkled across the lake to the west. I decided I need a self-portrait here, and pulled out a small tripod for my camera. I set it up, aimed it at a scenic outcrop of rocks, clicked the shutter button, raced over the rocky terrain, and posed for the photo. I waited a few seconds, surely long enough for the photo to have clicked, then wandered back to check out my results. Which were disappointing--all I saw was a rock with a scenic view. I wasn't in the photo at all! Let's try that again.... I set the self-timer, then raced as fast as I could back to the viewpoint. It was a ten-second timer which seemed like it would be long enough, but the rocky terrain was very difficult to travel over fast. However, this time when I made it, I did see my camera flash a red light. I'm not sure my "posing" had been completed, but at least I would be in this photo! Except when I looked at the photo, I still wasn't in it. What the heck? I scratched my head in puzzlement. How was this possible? Well, let's try it again--but this time, I'll have to be even faster getting over there! I tried this a few more times before I realized that I was standing on the wrong rock. There was one rock outcropping with two tops, right next to each other, and I aimed at the more scenic one, but stood on the less scenic one thinking that was the one I aimed at. In my defense, it would have been suicide to scramble out on the more scenic one--it was a very precarious location! And I didn't even think it was possible for me to get to that scenic one in a mere 10 seconds. I needed a 30-second delay if I wanted my photo on that rock. I'll just have to go with the less scenic rocky top, then. I adjusted the aim of the camera and tried it again, rushing up the rock, making a quick pose. Then I returned to the camera to view the results which had.... my foot on the rock with the rest of me completely cropped out of the photo. Hmm.... That wasn't what I expected! The view through the camera wasn't anywhere near as wide as I thought it would be. I adjusted the direction of the camera upwards and tried again. And again. Seems like I spent a half hour trying to get a stupid self-portrait of me at this scenic viewpoint, but it just wasn't working. I finally gave up and decided to try a completely different rock from a different point of view completely. It took a few tries, but I finally got a photo I liked. Well, at least I managed to get my trekking pole in this photo! Hey, I managed to get an entire LEG into this photo! which worked out a lot better! Then I continued my hike. The rest of the hike was largely uneventful, the trail winding back into the trees which once again obscured the views. Along the way, I passed two hikers early in the morning, and two more later in the afternoon. And one mountain bike near the end of the day's hike. It certainly wasn't a very crowded trail! I had to hike about a half-mile off the TRT to reach the Kingsbury Grade North trailhead where Amanda was already waiting for me. She picked up an ice cream sandwich for me that was a gooey mess by the time I arrived, but I tried to eat it anyhow and made a bigger mess of my face. =) She had purchased a foam ice chest and thought the ice cream sandwich might hold up if it rested on a block of ice, but it didn't. The cold Coke worked out a lot better, though. While I was off hiking, Amanda had driven into town and picked up a permit for me for the Desolation Wilderness. 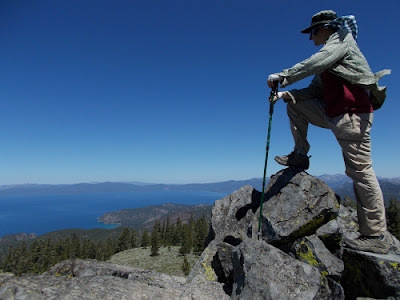 The only section of this trail that requires a permit is the Desolation Wilderness. Thru-hikers, like myself, weren't subject to quotas like weekend backpackers were, nor did I have to select a specific area of the wilderness to camp in like weekend backpacker had to. But I did need a permit. The Desolation Wilderness is on a section of the trail that overlaps the PCT, so I was familiar with it. Also, on the entire Pacific Crest Trail, in only one location did a park ranger ever check my permit--in the Desolation Wilderness. And not only did they check my permit, but there were two different park rangers I crossed paths with in that wilderness who checked my permit! I had absolutely no intention of walking through that wilderness without a permit. Those people are strict about their permits! So I asked Amanda if she'd go and see if she could pick up a permit for me while I was hiking. They closed at 4:30 in the afternoon or something like that and I wasn't entirely sure when I'd finish my hike. I wasn't even sure if they would even allow Amanda to pick up a permit for me, but it would be nice if she could get that taken care of while I was hiking. One less thing to worry about later. "You also need this," she told me, shoving a couple of black bags in my face. "They're poop bags. You have to carry everything out of the wilderness area." What?! I had heard nothing about people having to carry their poop out of the wilderness. I've been on rafting trips where it was required, and I know people hiking to the top of Mount Rainier have to pack it all out. Particularly sensitive areas do have such draconian rules, but I hadn't heard anything about the Desolation Wilderness having such a rule. I certainly didn't know about it when I hiked the PCT through the area, and I hadn't seen anything on the Internet about such a rule. Now, I'm not particularly squeamish about the idea of carrying around poop. However, I didn't want to carry around the weight of poop. That stuff is heavy! I love dropping a giant load somewhere along the trail and knowing, "Yeah, that just took two pounds off my feet." Amanda started driving us back into town, which would take us through the bustling down of Stateline (since it's located right on the California/Nevada border). And neither of us had eaten lunch yet, and I had an idea--we'd eat at Straw Hat Pizza. Straw Hat in the chain! I happened to know, because I know everything (just ask Amanda, she'll vouch for me! 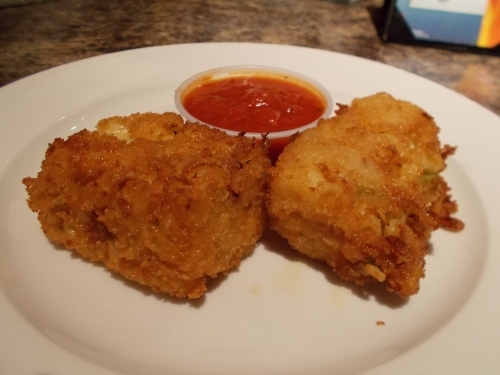 ), that there was a Straw Hat Pizza located in a casino in Stateline. Okay, the only reason I actually know this is because as most of you probably don't know, I actually have a contracting job with Straw Hat to update their website on occasion. 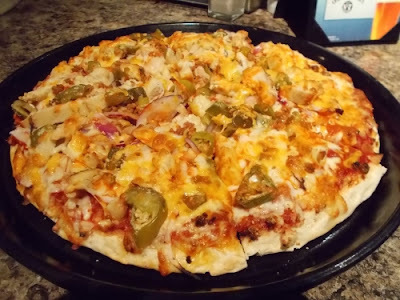 Anyhow, there aren't any Straw Hat Pizzas in the entire Pacific Northwest, so it's not like I have many opportunities to check out their food. And sometimes, I wish I had photos of some of their products that I could work with or whatever the case. "It'll be a working lunch!" I told Amanda. "We could be mystery guests!" Except that I only remembered that the restaurant was in a casino in Stateline. I didn't remember which casino. But no problem--I called up my old buddy Scott who sucked me into working for Straw Hat in the first place and asked him where it was located. I knew he'd know. He's probably been to every single Straw Hat Pizza a dozen times or more. "Harveys," he told us. "It's in Harveys." He described the casino--one of the large ones in Stateline that's impossible to miss, and also told me that it's the highest volume store in the chain. Really? I did not know that.... but as the webmaster for their website, I'd have no reason to know something like that. Will this photo ever show up on the Straw Hat website....? So we parked in a parking garage, then wandered around the smoke-filled casino looking for pizza. We ordered, took a booth near the back, and I immediately whipped out my camera and started taking photo of the store. (I might be able to use these for something later!) The food came out, and before Amanda and I started eating, I took quite a few photos of the food as well. Then we ate, took more photos, and eventually headed back outside to the car and drove to artTrekker's place for the night. looking like they were "lost on the plate." Oh, and as you might notice in this photo, I shaved off all my hair for the hike. Great start for another long walk. Love the lake photo and your effort for a pic on rocks. Several rocks, lol. Got a kick out of that. 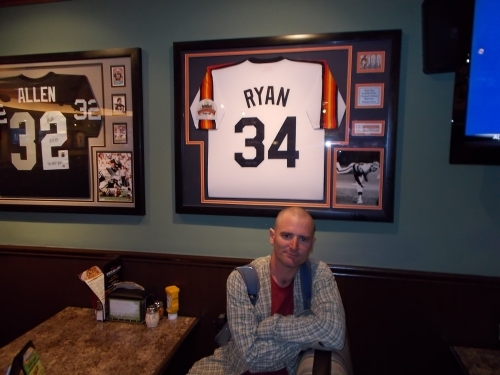 You may have found a Ryan shirt to pose by but I have you beat. While letterboxing together in a cemetery in Portland, my friends found a grave of Susan Johnson! I posed by it and a photo of it is now my FB cover photo. Your pictures are amazing, thank you for sharing your adventures...I am in awe!